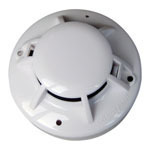 Wireless Heat Detector monitors and responds to the change in Ambient Temperature. Fire generally causes a rapid raise in temperature in the nearby location. The ALWHD series Heat Detectors senses the raise in temperature and signals the alarm if the temperature goes beyond 57°c. The detector is powered by 9V alkaline battery and has a built in sounder. Trader of addressable fire alarm system, addressable intelligent fire alarm panel, addressable hooter etc.